Born in Shipley, West Yorkshire, Ian Hay's family moved to the US Airforce base in Isfahan, Iran, where a ride in a Kaman Huskie helicopter sparked an interest in aviation. 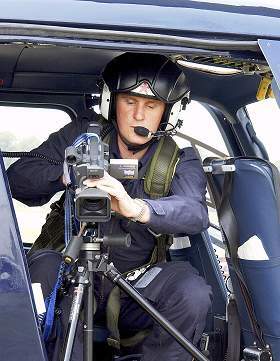 This eventually led to a career with the Metropolitan Police helicopter air support unit as an air observer/photographer, flying over London on a daily basis. Much of the footage shown on Police, Camera, Action was filmed by Ian using the stablised video Superball. The police also provided extensive training in photo analysis and digital imaging techniques. Ian works for Flight Images, based in the heart of Surrey and one of the UK's leading aerial photography companies specialising in a wide range of aerial imaging activities. The company was formed in 2000 with highly experienced personnel from both military and police air support unit backgrounds and quickly developed an enviable reputation for providing superb quality aerial imagery. Flight Images has worked on behalf of a wide range of clients, many of them overseas. Projects include a pipeline survey in Kazakhstan for Chevron-Texaco, flight simulator imagery for the US Navy, infrared survey in Greece for BBC Horizon and the end sequence for Blockbuster's TV advert. In 2003 Flight Images acquired London Aerial Photo Library, one of the largest and most up to date aerial photo libraries in the UK. The library holds in excess of 300,000 images with extensive coverage of most of the country. Its photographs of London are second to none with comprehensive oblique and vertical photos which are constantly being updated. The company operates a number of aircraft and helicopters, including a twin engine Chieftain, which carries out continual nationwide digital survey work on behalf of Get-Mapping using the latest state of the art Vexcel Ultracam D camera. Ian's skills have proved invaluable to Flight Images, which has a reputation for tackling technically difficult projects, which other aerial photography companies are reluctant to undertake.